Constellation pins and STS-130 mission patch set against the Lunar Orbiter I first photo of the Earth from the Moon. The 1966 image inspired the 2010 shuttle Endeavour emblem. Twenty-fivelapel pins, each bearing the logo of NASA's now-canceled Constellation programto return astronauts to the Moon, are packed and poised to launch next week onspace shuttle Endeavour for a round trip mission to the International SpaceStation (ISS). Theone-inch, red, white and blue triangular pins appear on the list of severalhundred mementos launching inside the STS-130 OfficialFlight Kit(OFK), a duffle bag-size stash of souvenirs flown on every shuttle mission atthe request of the space agency, its partners and the astronaut crew. Thecontents are distributed post-flight as a small token of thanks to those whosupported NASA and the mission. Thekit's contents were approved on Feb. 1, the same day that President BarackObama released his budget request for NASA, calling for Constellation to becanceled in favor of extending the ISS and launching astronauts on a new fleetof commercially providedspacecraft.The new plan, which first needs Congressional approval, would also fundtechnology research and development efforts to ultimately send astronauts to multipledestinations beyond low Earth orbit. Endeavour, which is scheduledto liftoff at 4:39 a.m. EST (0939 GMT) Sunday, is not the first to fly mementosfrom the Constellation program. Similar logo pins, patches and evenConstellation ornaments have flown aboard the past nine shuttle missions since2008. TheConstellation lapel pins aren't STS-130's only onboard reminder of NASA'snow-in-flux lunar plans: Endeavour's primary payload, the European-built,U.S.-funded Node 3 space station connecting module was named "Tranquility" after the siteon the moon where Neil Armstrong and Buzz Aldrin landed Apollo 11's lunarmodule in 1969. "Ithink the name for our module is very appropriate. Of course it means a lotmore than the word itself," STS-130 pilot Terry Virts told collectSPACE.comduring a pre-flight interview. "There is also the history between the Seaof Tranquility on the Moon and the module." Virts,who served in the same fighter squadron that Aldrin flew with 40 years earlier,invited the moonwalker to watch Tranquility's launch. "Ihad not actually made that connection myself, between Buzz and the name of ourmodule, but I'll have to bring that up to him the next time I talk tohim," he said. Virtshas another connection with Aldrin onboard, a small set of moon rocks collectedfrom Tranquility Base. Before their launch to orbit, the lunar pebbles werecarriedto the top of Mt. Everest by former astronaut Scott Parazynski. Togetherwith a piece of Everest's summit, also retrieved by Parazynski, theplaque-mounted moon rocks will be displayed inside Tranquility's new seven-windowedCupola to inspire the astronauts working there. "Imaginebeing in the Cupola and looking out this huge series of windows and looking atthe moon and having a piece of the moon right next to you. What's that going tobe like? I have no idea. I'll come back and tell you," said STS-130mission specialist Stephen Robinson. Robinsonhad a role in including aboard the flight another, albeit subtle, nod to NASA'slunar exploration history in the form of his and his crewmates' mission patch. Thesix-sided emblem, which was shaped to resemble the Cupola viewing port attachedto Tranquility's side, depicts the Earth as it was first seen in a photographtaken from the moon by Lunar Orbiter I.
Robinsoncame up with the idea for the patch as he was working in mission control theday after being assigned to Endeavour's crew. "I'dseen that first photograph of the Earth from the moon, taken in 1966 and I'mone of those guys who remembers 1966 and being excited about things made byhumans going to the Moon and maybe people would someday go there," herecalled. "So that was an exciting photograph to me." Robinsonused software from his seat in mission control to simulate the view looking outfrom the Cupola, took a screenshot, printed and then cut it out. "Allon console I am doing this... I have this idea burning in my head! So I cut outthe Cupola from the screenshot printout and cut the little windows out -- andI'm talking to the [station] crew between doing all of this stuff -- and laidit on top of a printout of that picture of the Earth." "Ishowed it to the flight director and said, 'That will be our patch,'"recounted Robinson. 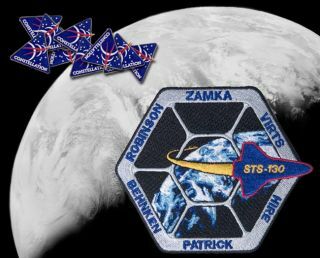 And soit was; in addition to the patches that the crew will wear, the mission's OFKis packed with nearly 700 of the four-inch embroidered badges. Continue reading at collectSPACE.com aboutthe crew's personal mementos and browse the full manifest of the STS-130Official Flight Kit.